Is the User Logged On? Passport is a tool that allows you to "sign in with Google", "sign in with Facebook" or "sign with Twitter". There are other options as well, including creating a basic sign in where the user enters their own user name and email. But Google, Facebook and Twitter are the options that most poeple want. The goal of this assignment is to allow you to add a Log On with Goggle and Facebook page to your web application. It will allow users to sign on to your site with their Google or Facebook accounts. It will then be possible to decide whether a user can perform a particular action depending on whether or not she is signed on. Having to authenticate users. Google has already done it for you. Having to write code that authenticates users in a secure manner. This is a very error prone process. When the user signs on, Google will pass some of their profile information to you. We can request that they send more or less information if they want to access our site. But for this exercise, we want to see only their public profile information. That is, we want to see only the information that they have already decided to show publicly. Normally we would store that information and the user's ID, in a database. We could store it in MongoDb, or CouchDb, but typically developers use a small fast database called redis for this purpose. There is a discussion of redis on Elvenware. In this exercise, however, we will skip the process of storing the user's name in a database. We'll get to that later. If it is outdated, then just reinstall. Passport is the tool we will use to allow the user to log on with Google. You are going to need a Google Developer's account. You won't need a new log in, as you can use your standard Google Account. Start at https://developers.google.com/. Click around. Get familiar with it. Note the Developer Console link near the bottom of the page on the right. Now go to https://console.developers.google.com. We are going to be using the Google Plus API, which is visiable near the bottom of the Dashboard. This is a free service, but there are some limitations. In particular, go to the quotas page. Note that you can only have 20 million users sign in per day, and no more than 25 thousand every 100 seconds. If you actually hit these limits, you can take solace in the fact that your web traffic is large enough so that your grand children will probably never know economic want. NOTE: Further testing suggests that it is best to add two separate entries to the Authorized Redirect Apis, one for each of the URLs shown above. Don't use a private IP like 192.168.1.1 that is not accessible from the WAN. Put the session code shown above just after the place where we use the cookieParser and express.static middleware, but before the place where we define the routes and user middleware that looks a bit like this: app.use('/', routes). Either way, this code will ensure that 500 errors dump a stack trace to the console. Without that information, debugging can be very difficult. There is quite a bit of set up code needed to get Passport up and running. Some of that code can be used by both the Google and Facebook strategies. This is generic code that you can use if you are logging the user into either Facebook or Google. It can likely be used with other Passport strategies as well. I put code the code that can be used by multiple strategies in routes/index.js. I then create separate modules for the Google and Facebook specific code. Note the Google Strategy code shown below returns the whole profile. Later, we can use the Profile to look up a user entry in our database. You probably want to spend some time examining the user information that you get in the serialize or Google Strategy method. It shows you what data was sent from Facebook/Google back to your location. * Created by charlie on 11/5/16. // Return Google profile for now. We will add Database data here later. For process.nextTick, see the docs. Instead of making the call immediately, it is more like a callback. We wait until the next time that node is not busy, then make the call. Node runs on an event loop, and in effect this is saying the next time the loop comes around. These are lines that get called when the user is being authenticated. You might want to add some console.log lines to this code if you want to better understand how the process works. We are now ready to begin testing our code. This is not the final solution for logging on, of course, but it lets you check that everything is set up correctly before you come up with a more user friendly solution. It is often helpful for the client to know whether or not the user is signed on. Let's add a simple Ajax call to Control.js. The call can return information about the status of the user. Now we are back on the server side. Here is code we might use to check if the user is signed in. Notice in particular the isAuthenticated method. 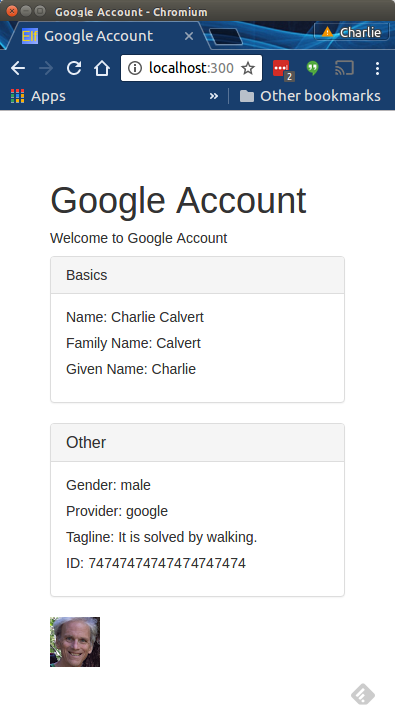 Create the profile-google.jade file that displays information about the logged in user. Here is what my version of that page looks like. I got all this information from my Google account. It was the data that I got when I logged into my account. This is the data that we are agreeing to share when we, as users, agree to use this strategy to validated ourselves. Your application must support Google and either Twitter or Facebook. For Twitter specific directions, go here. For Facebook specific directions, go here. Place your work in the appropriate folder in your repository, if it is not there already. Run eslint and prettier one last time. Submit your assignment.